Do you love to quilt, but find that your current sewing machine just doesn’t stand up to the tests that you give it? Are you looking for an affordable way to get an amazing amount of versatility for any of your sewing needs? 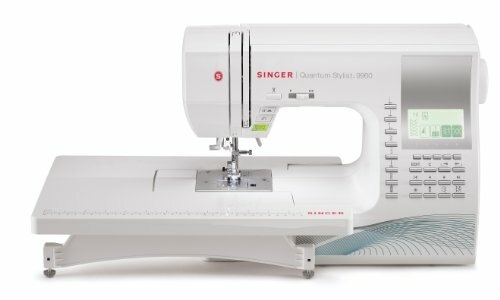 The Singer Quantum Stylist 9960 offers an incredible amount of options for a sewing machine that is priced right around the $300 mark on Amazon right now. With a wider table for quilting or other larger projects combined with 600 different built-in stitches, this sewing machine could be the all-in-one option you’ve always wanted! What Are the Features of the Singer Quantum Stylist 9960? First and foremost, you get 13 styles of fully automatic buttonholes with this sewing machine. That is complimented by 5 different fonts so that you can do some embroidery after you’ve attached some buttons! You’ve got customization with each pattern design that is included with the Singer Quantum Stylist as well because you can elongate a pattern, create mirror imaging, and control the look of every stitch that you make. there are 18 presser feet that are included with your purchase that will help you take advantage of the free arm and automatic features. When you see everything that you get with the Singer Quantum Stylist, you will have to look a second and a third time at the price. With an extra large sewing area and the digital information advisor helping you control the 600 stitches, there are sewing machines that cost twice as much which don’t even offer half of the features that this Singer does. Are There Advantages To Owing the Singer Quantum Stylist? What we really loved about this sewing machine was the drop feed with box feed motion that is incorporated into its design. All you’ve got to do is lower the feed dogs and you’ll be ready for free-motion embroidery. Want to do monograms? Done. Need to sew on some amazing buttons? Done. The feed dogs keep the materials going throughout the entire process so you get a professional result every time you use the machine. As with any sewing machine, you will want to make sure you cover up the needle plate area with a cloth or something so that you don’t drop a needle into the body of the machine. It’s a pretty expensive fix if this happens and it can happen to any sewing machine, and it will save you a headache later on if you just develop this habit. If you want something good now that you can continue using years from now, then the Singer Quantum Stylist is a pretty amazing buy. Take a look for yourself and we think you’ll see too why we consider this one of the best sewing machines around. Click here to look at pricing on Amazon and buy theSinger Quantum Stylist 9960.